Acting Police Commissioner EP Andrewartha stated in the 1916–17 Annual Report that more women would be employed “as soon as a few can be found who in points of character, physique and education satisfy requirements, and who may be relied on to act with firmness and courage”. After Kate Campbell left in early 1918 two more policewomen were employed, one in Launceston and one in Hobart. Maud Hughes and Maud Cross were the second and third policewomen. They were highly regarded and, in 1920, both women were commended for their work in helping young women. Left: Great work by Policewomen Hughes and Cross, (recreated excerpt from The Mercury, 13 April 1920). 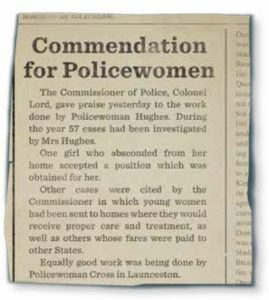 This page -- https://www.police.tas.gov.au/about-us/100-years-women-policing-tasmania-police/first-women-tasmania-police/maud-hughes-maud-cross/ -- was last published on January 17, 2018 by the Department of Police, Fire and Emergency Management.